Protect staff securely and enhance the ticketing, information and payment process with Safetell Pay Window units. 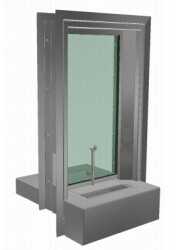 Standard off-the-shelf solutions or custom solutions made to match project requirement are available. 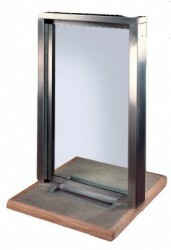 The PW2 is designed for internal use and transfer of smaller items through a shallow transaction tray. 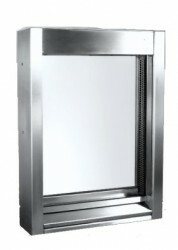 PW2 units are designed to be installed into prepared openings. If the install location does not have sufficient wall width to support the unit, additional wall enhancement with CityWall can be supplied. All internal windows are fitted with a rectangular base, which is inlaid with linoleum (blue/grey as standard) and finished with ash hardwood edgings. 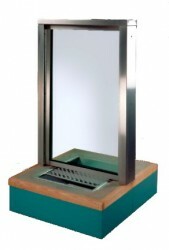 All the windows feature a stainless-steel frame and transaction tray. 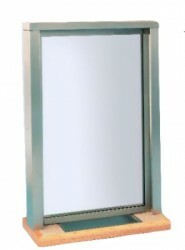 The tray is available in a range of sizes and the frame allows natural voice transference in both directions.